1. RR Museum of PA Overview map 2. Click on image for a larger view. 2. PRR 4-4-0 class D16sb 1223. Built Juniata Shops 1905 for passenger service. 3. 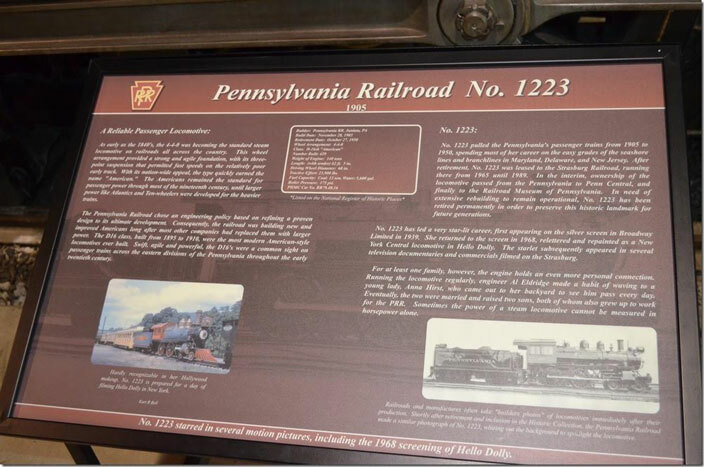 PRR 1223 display board. Click on image for a larger view. 4. PRR 4-4-2 E7s 7002. 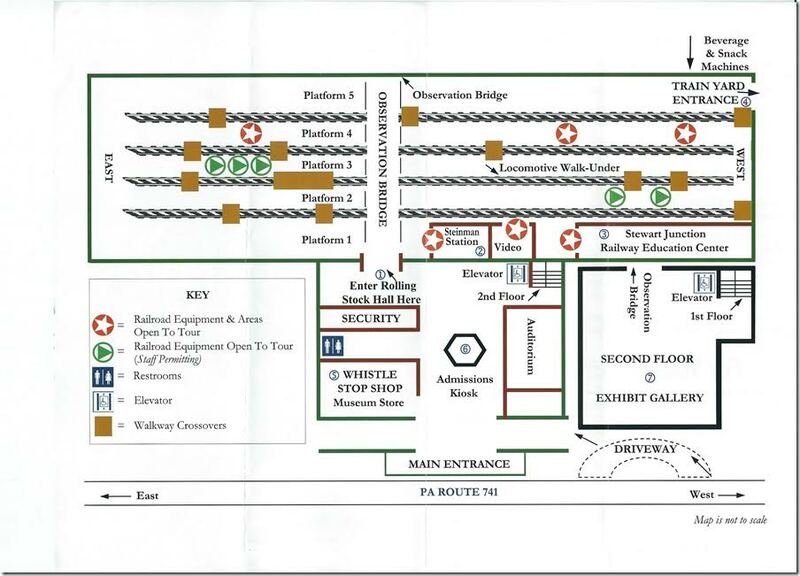 Built Juniata Shops 1902 for passenger service. 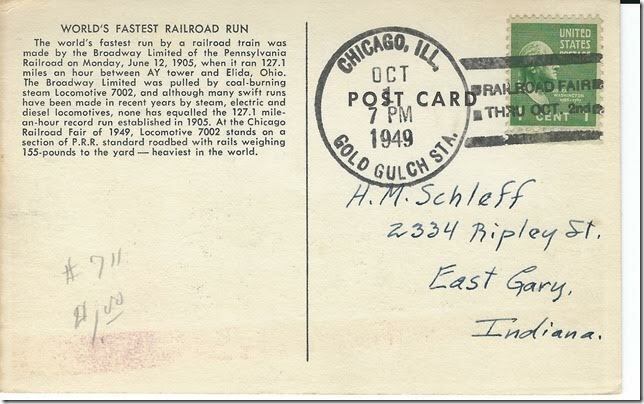 Built as 8063, but reclassified as E2 7002 in 1948 to represent world’s record speed holder. The original 7002 has been scrapped prior to that date. 5. 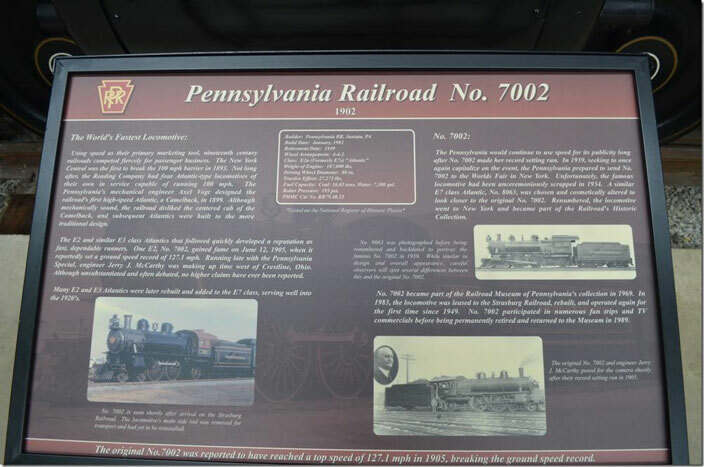 PRR 7002 display board. Click on image for a larger view. 6. 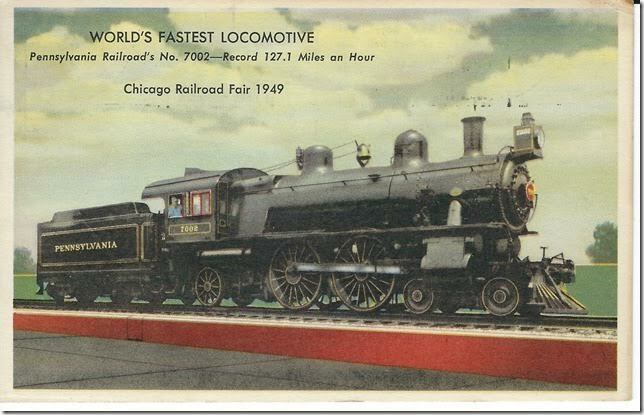 PRR 7002 4-4-2 postcard. 7. PRR 7002 postcard view 2. 8. 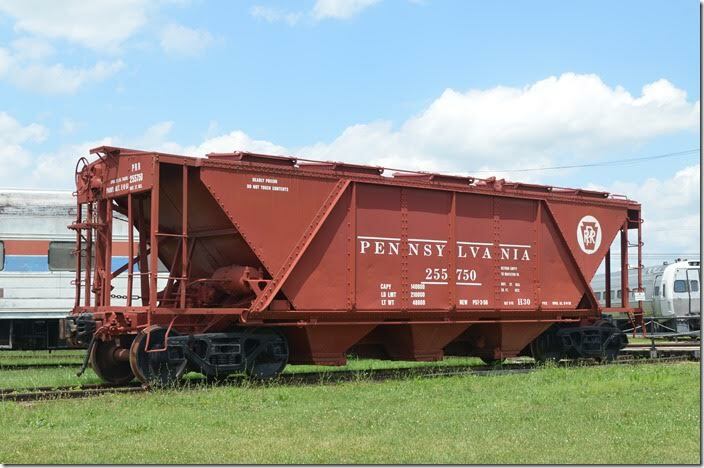 Lehigh Valley RDC-1 40 was used on the Hazleton Branch to connect with main line trains at Lehighton PA. 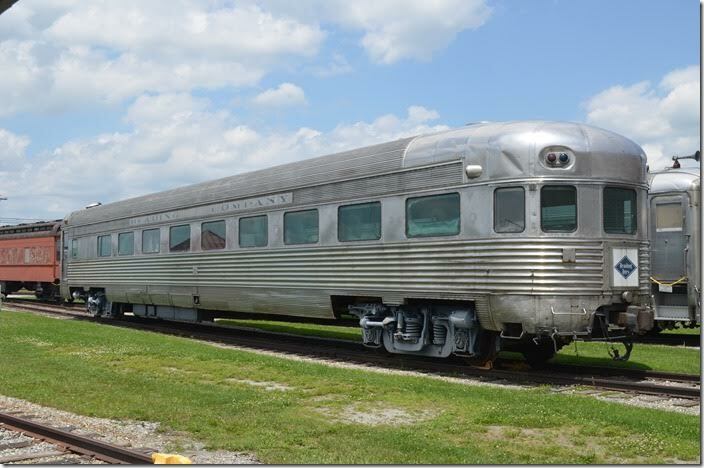 It was built by Budd in 1951 along with RDC-2 (had a baggage compartment) to replace gas-electrics on the branch. 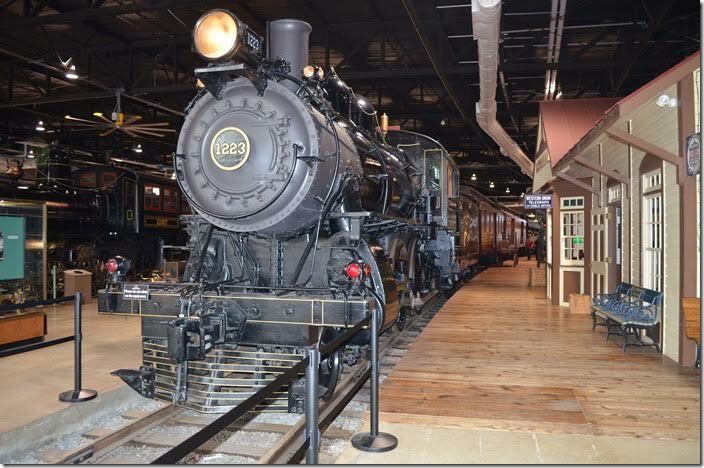 When main line passenger service ceased in the early 1960s, 40 continued on for a few days making it the last passenger train on the LV. 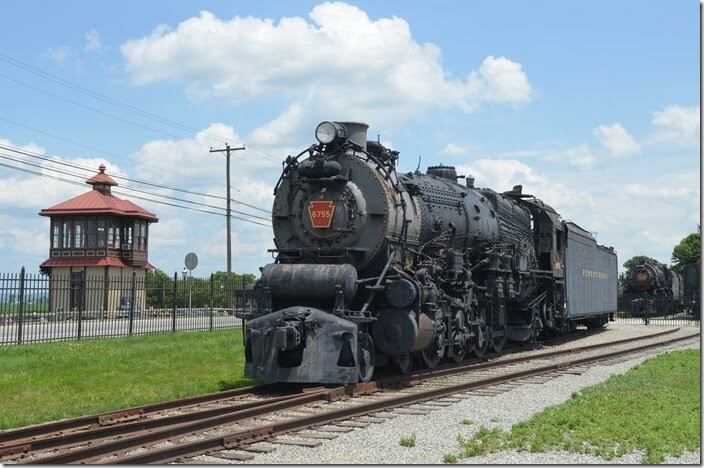 C&O had six RDCs, and two closed out passenger service on the Big Sandy in 1963. RDCs were valuable, and this one didn’t stay idle for long. It was sold to the Reading in 1961. 9. 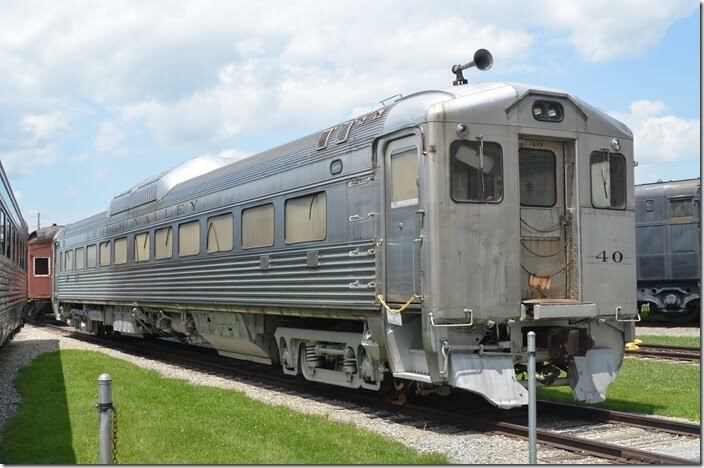 Reading Co. observation car 304 served on the Philadelphia-to-New York Crusader, the first stainless steel passenger train in the east. 10. PRR covered hopper 255750 was built in 1950. 11. 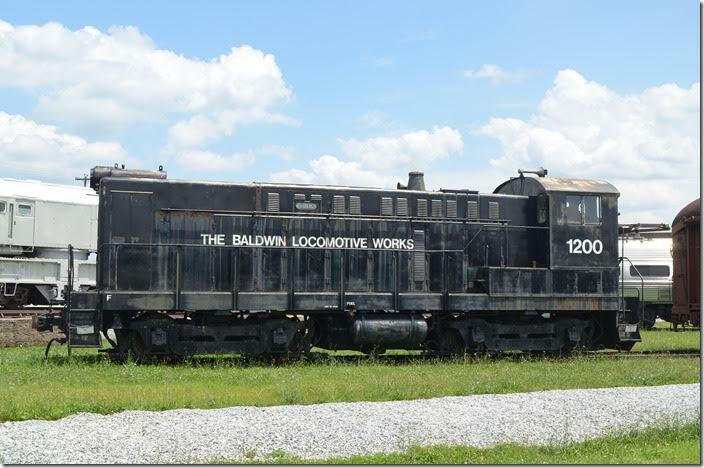 Baldwin Locomotive Works S-12 1200 was built in 1951. 12. 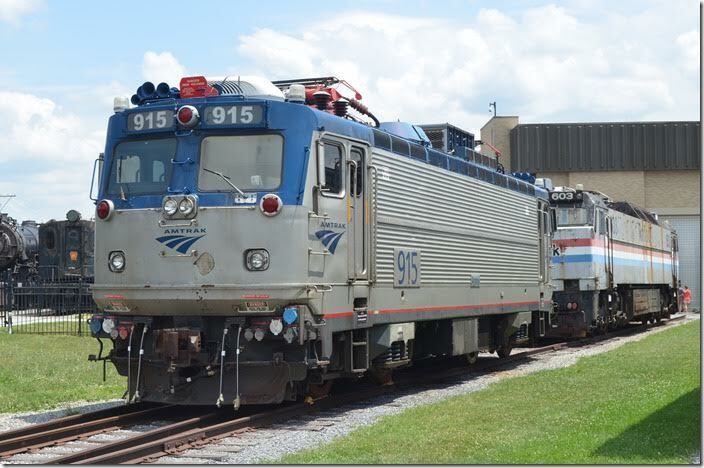 Amtrak 915 AEM7 was built in 1981 by EMD/ASEA. E-60CP was built by GE in 1976. 13. 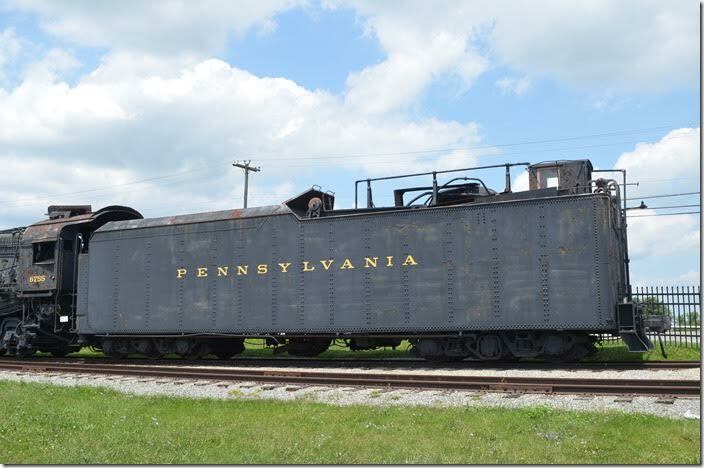 PRR M1b 6755 was built at Altoona in 1930. 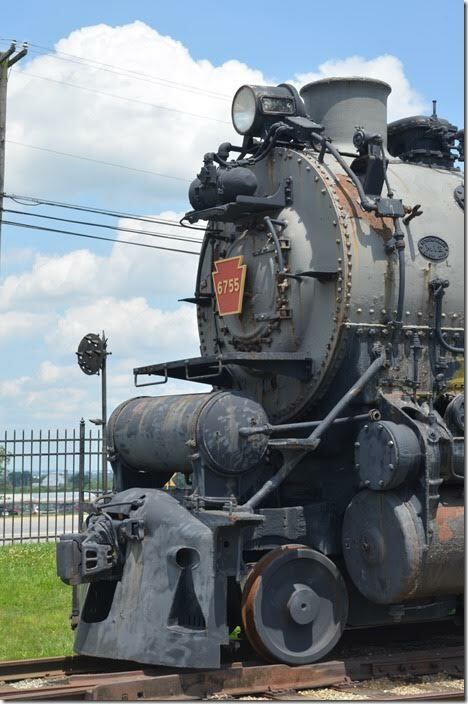 Restored LEMO tower is in the background across the road at Strasburg Railroad. 14. Two Pennsy classics! PRR 6755 M1b. 15. Tender 6737 class F210.F.75, engine 6755. 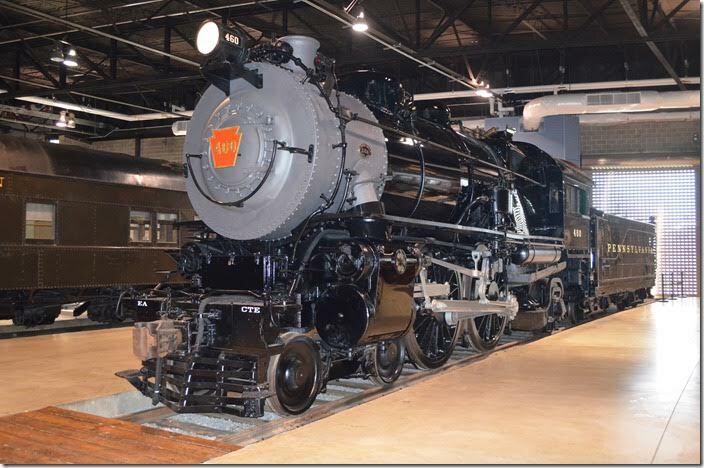 M1s were among my favorite steam locomotives. 16. PRR 4-4-2 E6s 460 was built in 1914. 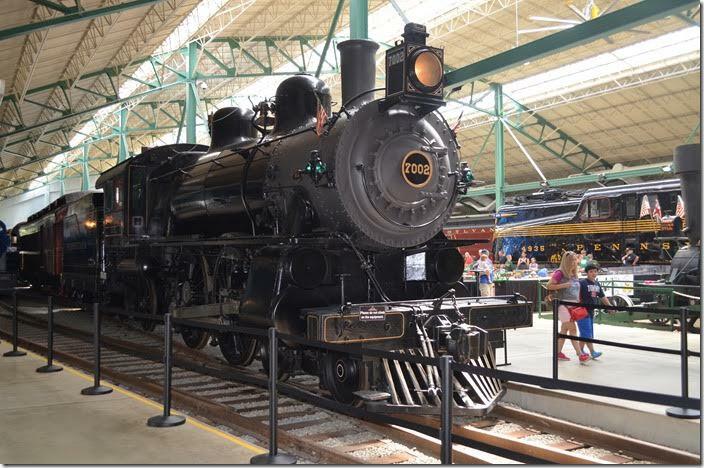 This is the Lindbergh Special locomotive. 17. 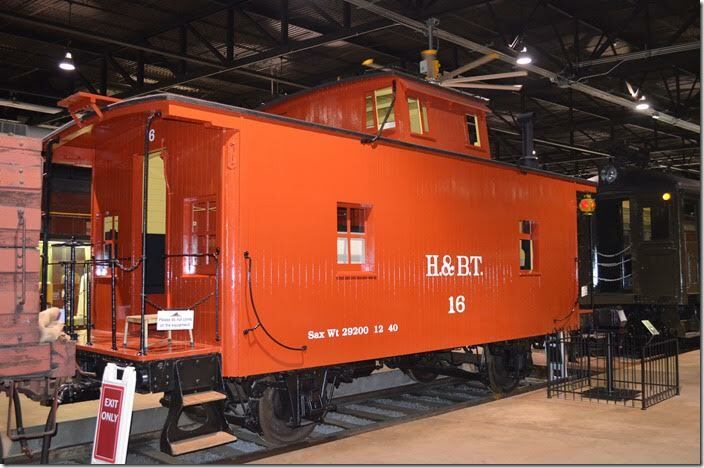 Huntingdon & Broad Top Mountain Railroad & Coal Co. cab 16. 18. 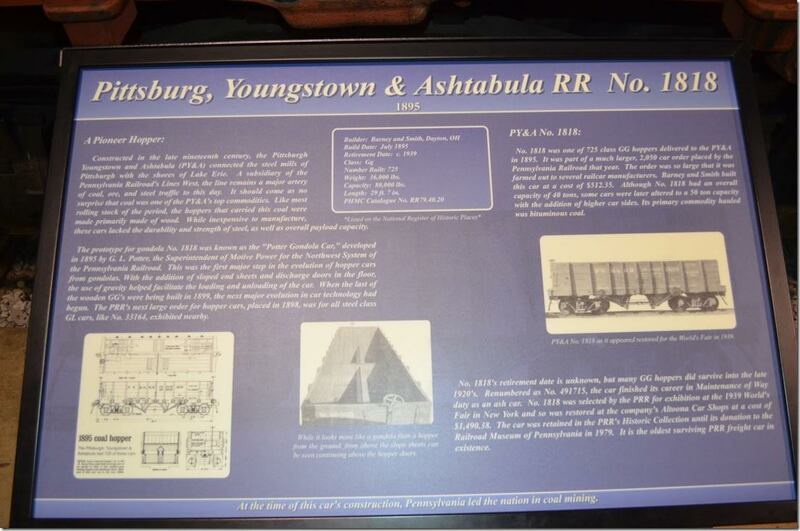 Pittsburgh, Youngstown & Ashtabula Ry. wooden hopper 1818. This car was built in 1895 for this subsidiary of the mighty Pennsy. 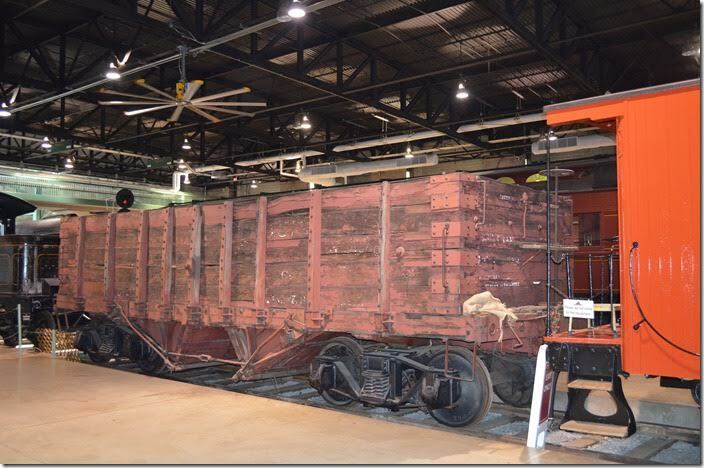 Earlier pictures taken at the museum show the paint in much better condition. Evidently it was displayed outside for a long time. 19. PY&A 1818 display board. Click on image for a larger view. 20. 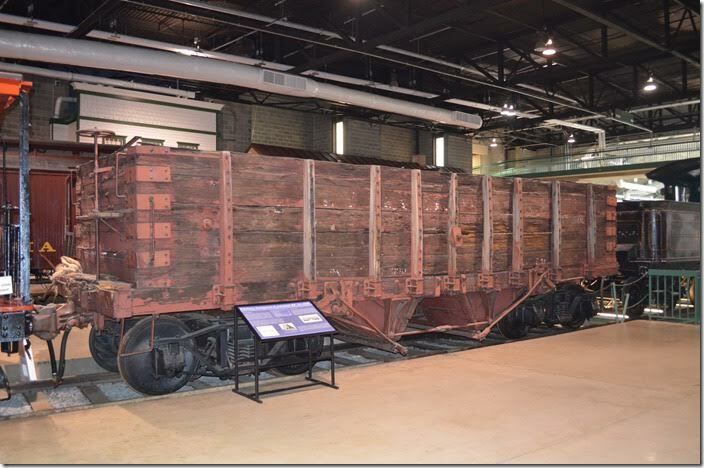 Wooden mineral haulers didn’t hold up well, but – as we shall see – the steel hopper was only a few years away. PY&A hopper 1818 view 2.